The genus name Aesculus is Latin for "acorn." The species name hippocastanum blends the Greek hippos, "horse," and kastanea, "chestnut," in reference perhaps to the use of the plant to treat respiratory problems in horses and cattle or perhaps to the horseshoelike markings on the tree's branches. Horse chestnut is a deciduous tree native to Eurasia that can grow 50 to 80 feet tall. It prefers well drained, moist soil in full sun to partial shade. Its leaves are large, rough, serrated, palmate, and compound. The flowers are hermaphroditic. The nuts are enclosed in prickly green husks. 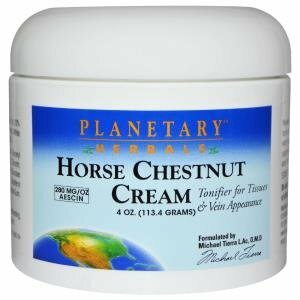 Horse chestnut helps strengthen the capillaries and decreases their permeability. It also helps move congestion. It is used in the treatment of arthritis, capillary fragility, edema, frostbite, hemorrhoids, phlebitis, and rheumatism. Topically, horse chestnut can be prepared as a poultice, salve, or compress to treat hemorrhoids, rheumatism, sores, sprains, swelling, and varicose veins. Horse chestnuts are not considered edible unless they have been soaked or boiled in multiple changes of water to leach out the toxins. Some Native Americans prepared a porridge from the nuts using this processing. Saponins in the seeds can be used to make soap. The wood, though weak, has a nice grain and is used to make household items. The nuts (seeds), as well as the leaves, flowers, and bark, are somewhat toxic unless processed; do not use raw or untreated nuts. The green shell of the nuts can cause digestive distress, drowsiness, and skin flushing and should be peeled off. Use horse chestnut only in small amounts, generally one-fourth that of other herbs. Nausea and gastrointestinal upset are possible side effects; the plant can also thin the blood. Avoid during pregnancy and while nursing.